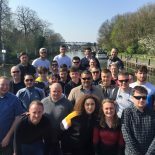 Last Friday saw 32 Apprentices and Trainees enjoy the Up River trip to Teddington. We were lucky enough to have fabulous weather, which allowed the apprentices to complete their worksheets outside.We chose to go up on the ebb to allow the apprentices more time to complete the worksheet requirements. Freemen were also in attendance and each completed 2 points of CPD. We must say a big thank you to Danny and John Collier who provided the vessel ‘Queen Elizabeth’ for the trip. Alex Hickman Training Officer.